Hi! My name is Joline Buscemi. I’m a full-time marketer and part-time freelance writer based in Florida. For the first time since middle school, I’ve stopped wearing makeup every time I go out. 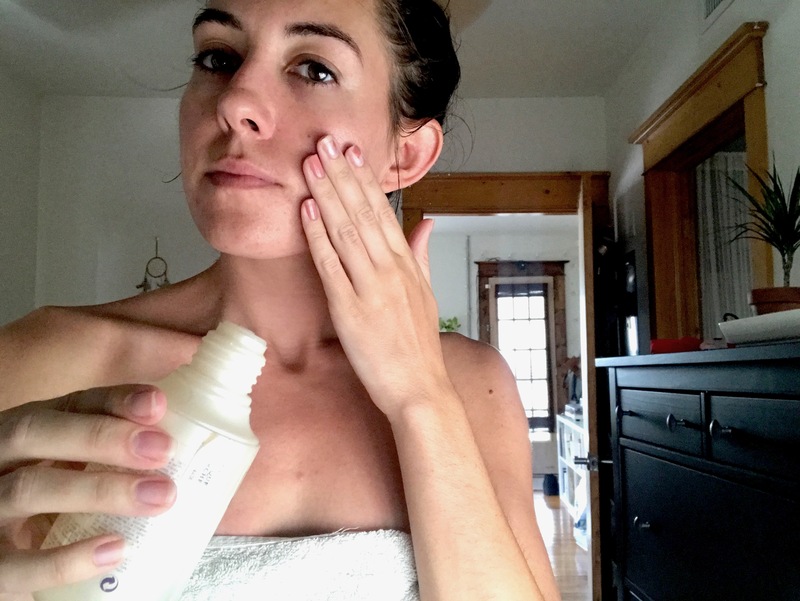 I have a well-curated skin care routine to thank for that (and probably my calming hormones). I’ve had bad breakouts since I was a teenager, and it wasn’t until recently (I’m 27) that I became happy with my skin. Because of this, it’s left me with PIH (Post Inflammatory Hyperpigmentation) and pitted acne scars, but over the years, I’ve learned to control those, too. 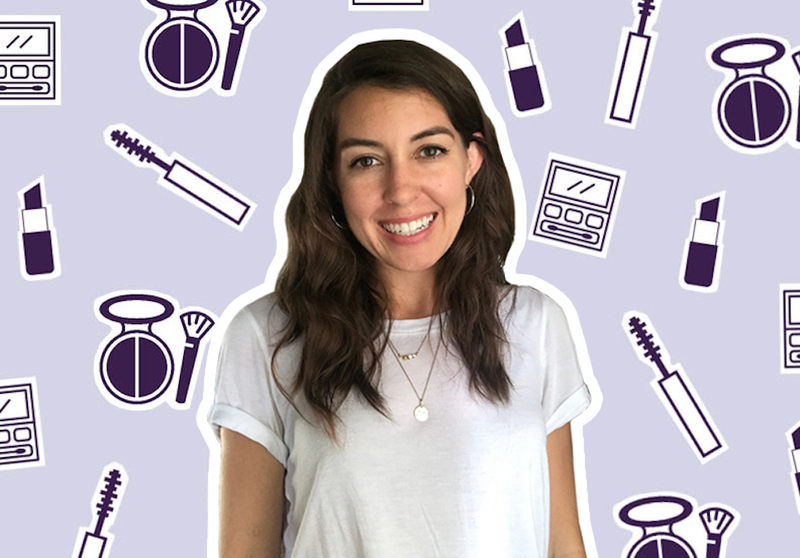 My beauty goal is to look my best naked — aka without makeup, a tan, or polish. I don’t ever want to feel like I need to put on makeup, even though I often still do, in order to feel good about myself. Because of this, most of my beauty routine centers on skin care and overall health. I used to wash my face every morning, but I did an experiment where I stopped for a while. Now, I occasionally use a wet washcloth to wash my face, especially if my skin feels like it needs it. To start, I use Paula’s Choice Skin Perfecting 2% BHA Liquid ($29), which is a chemical exfoliant that cleans out pores with salicylic acid. I’ve been using this for years. I pour a little into my hands and pat the liquid into my skin. I used to apply it with cotton rounds, but those felt wasteful and it absorbed too much product. While I wait for the exfoliant to soak into my skin, I usually get dressed or play with my cat. Next, I apply moisturizer and sunscreen. I’m embarrassed to admit I only recently started wearing sunscreen. I use Murad’s Anti-Aging Moisturizer Broad Spectrum SPF 30 ($48), it’s especially good for blemish-prone skin. Since it’s summer and my skin is oily, this is all the moisture I need in the morning. I am obsessed with watching makeup and beauty tutorials on YouTube (my favorites are KathleenLights and Violette), but thus far, I haven’t mastered eyeshadow or any advanced makeup looks, so I keep my routine simple. To begin, I clean up my brows. I used to hate my full brows. In high school, I dyed them a lighter shade (aka orange). But now everyone wants thick brows. I don’t do much to my eyebrows. I brush them up with a spoolie and use a pencil to shape the arch. If I’m feeling it, I’ll use Glossier’s Boy Brow ($16) to brush them up even more, even though I think it’s overrated. I’ll probably go back to using a drugstore product when I run out. I’ve used a sponge to apply my foundation for years, and I was convinced it was the only way to make foundation look good, but then I got a Foundation Brush from ColourPop ($9) along with their No-Filter Foundation in shade 70 ($12). Let’s just say, I won’t be using a sponge any longer. So far I like the ColourPop foundation, but I’m still testing it out. My go-to is usually the Nars All Day Luminous Weightless Foundation ($49) in the shade Santa Fe. I don’t like heavy foundation. My skin has transformed drastically that I don’t like covering it up with thick foundation. I also like to skip concealer. Even though I have dark circles, I just don’t feel like myself when I conceal them. I’ll use my foundation there and on my eyelids to even everything out. To set my foundation, I use ColourPop’s No Filter Loose Setting Powder ($9). It’s new to my routine but I love it so far. I add the Physicians Formula Butter Bronzer ($10.69) to contour, dust it across my eyelids, over my nose, and a little bit on my forehead. It smells delicious, like a tropical vacation, and isn’t orange. Blush is new to me, but I love how it freshens up a face, so I use a sample of Make Up For Ever’s Artist Face Color ($23) in B302 that a co-worker gave me. Instead of using eyeshadow for my eyes, I love to use bronzer. I feel like it adds dimension. I also love doing a cat-eye. For my eye shape, I like to draw the line as if I’m extending out the bottom lash. A tip I picked up while watching Violette on YouTube is to use a finger to extend the flick before the liner dries. She also has a video where she smudges out the top of the cat-eye, which I love to do, too. I like the Clinique Pretty Easy Liquid Eyeliner Pen ($21). It’s not as long-lasting, but if you don’t rub your eyes, you should be okay. Next, I’ll use whatever mascara I have laying around. I like drugstore mascara the best. To be honest, I haven’t noticed a huge difference between those and the ones at Sephora. The last step I do is lips. I always start with a balm. My absolute favorite is the Fresh Sugar Advanced Therapy Lip Treatment ($26). I’ve repurchased it about five times. 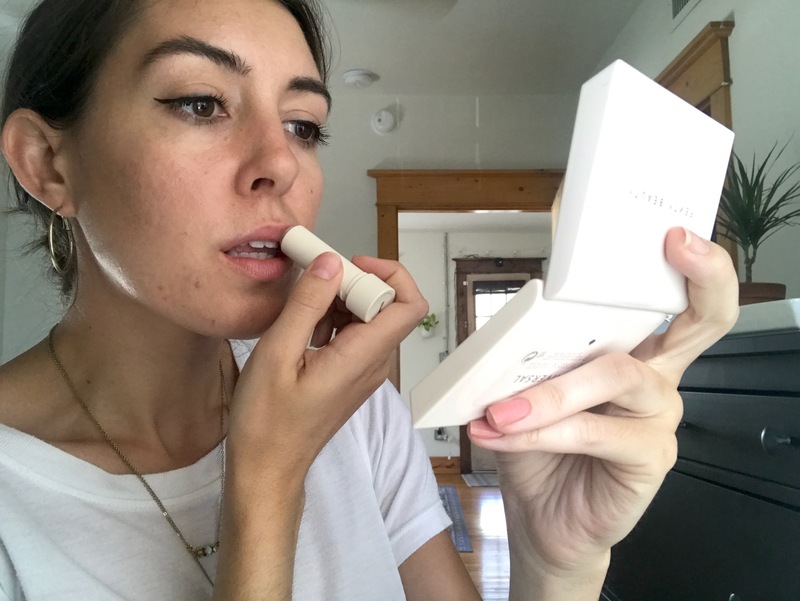 Before I started using it, my lips were always chapped and this balm completely transformed them. I have a lot of lip colors but I never use them. I can never get past worrying if my lipstick has smudged or if I’ve rubbed it onto my cheek. When I do wear something, I like using ColourPop’s Lippie Pencil because they stay on well and don’t fade weird. Clique ($5) is a nice bright red. I also love the Nars Velvet Matte Lipstick Pencil in Cruella ($27). If my makeup looks too matte, I’ll highlighter down my nose and in the corner of my eyes. The cupid’s bow is my favorite place. It’s a small thing, but it makes a big difference. I use the ColourPop Super Shock Highlighter in Wisp ($8). Then I’m done! Somewhere along the way, I forgot to learn how to do hair. I just hope that it looks good when I wake up. If that doesn’t work out, I throw it up in a ponytail or clip it back. I’ve learned a few tips on how to make it look nice in the morning. I either sleep in a French braid (either one or two, depending on how wavy I want it) or I blow-dry my hair. This does make it look better, much to the disappointment of my very weak arms. As much as I hate the task, I love having a clean face. It doesn’t hurt that my cleansing balm, the Banila Co. Clean it Zero Purity ($25), is fun to use. This balm starts off as a solid, but it turns oily once you rub it on. I rinse it off and do some light exfoliation with a wet cloth. Sometimes I follow it up with a double cleanser, like the Vanicream Gentle Facial Cleanser ($8.99). Typically, the cleansing balm is enough. After cleansing, I use Biologique’s Recherche Lotion P50 (the one without phenol). I’ve used this for years. I don’t even know what makes it work so well, I just know that my skin looks better when I use it. The first few weeks of using it, my chin broke out, but since then, it’s been a key product in my routine. It’s expensive, but I’ve been using the same 5.1 oz bottle for at least a year. Like my morning routine, I apply this one with my hands so I don’t waste the product in a cotton round. I let my skin settle after using the Biologique lotion. Sometimes it’s 20 minutes, sometimes it’s hours. At this point, I’d usually use the CosRX Triple C Lightning Liquid Vitamin C Serum ($27), but I ran out. I wasn’t planning on repurchasing it since my skin was looking good without it, but I noticed that marks from my breakouts aren’t going away as quickly. If you have PIH discoloration from acne, you need this product. Within a few weeks of use, you’ll look in the mirror and realize that they’ve faded significantly. Now is when we get to the real treatment part of my routine. I use my Curology prescription ($19.95 a month). 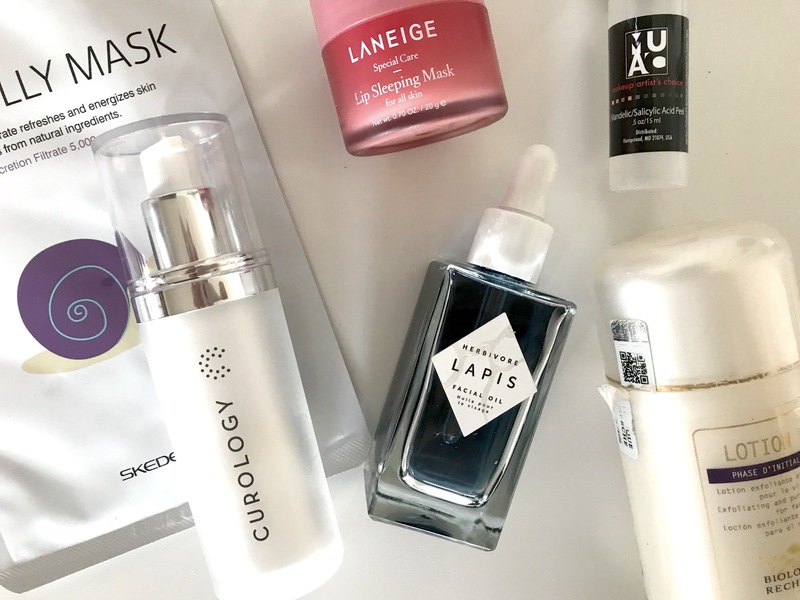 Curology is a platform to get personalized skin care products recommended by dermatologists. You answer a few questions, and then you’re prescribed products that will help with your skin concerns. For me, I use tretinoin (retinol), clindamycin, and azelaic acid. I feel like Curology has helped me to improve my skin. My final step is moisturizer. Right now, a light oil is enough to keep my skin fresh. I like applying the Herbivore Lapis Oil ($72). 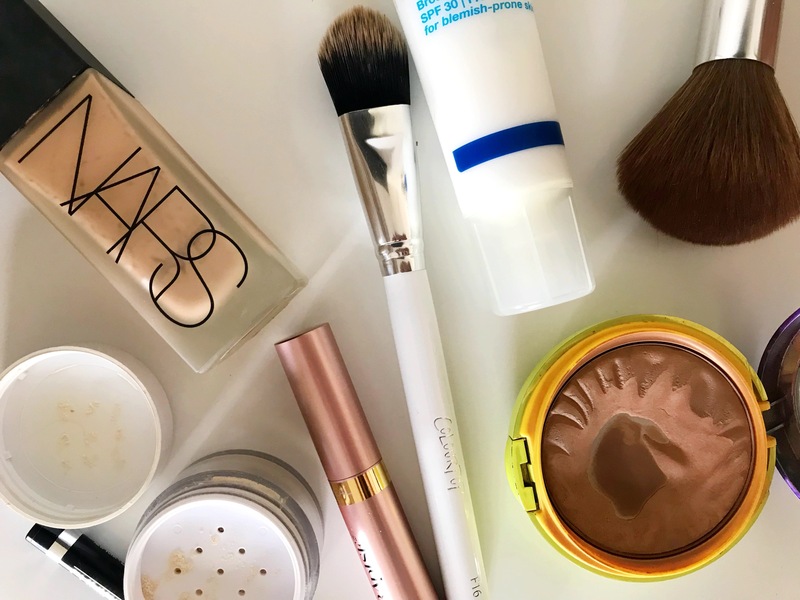 It’s a new addition to my routine, but I already know I’ll repurchase it whenever I run out (which should be a while — it’s pricey, but it lasts forever). I noticed immediate results when I started using it, like less breakouts and more balanced skin. Plus, I just love using oils, especially one that is as pretty as this. It always feels luxurious to slather it on. I try to remember to take care of my neck and chest. Sometimes, I’ll apply my products all the way down. Every couple of weeks, I’ll do a chemical peel. 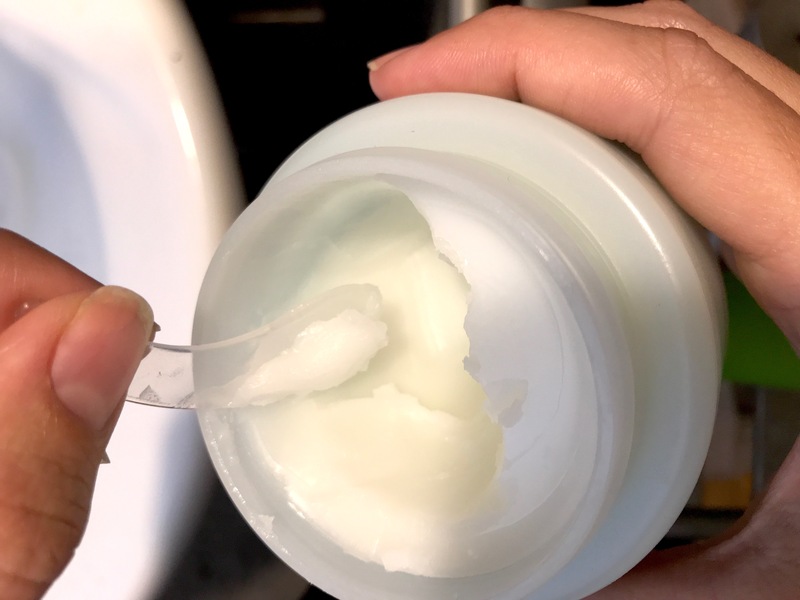 I’ve written about Makeup Artist’s Choice Mandelic/Salicylic Peel (starting at $9.50) already, but I’ll say it again: this peel is cheap and effective. Expect to be dry for a few days, but over the course of a few months, I’ve watched the pitted acne scars on my cheeks smooth out. Once a month or so, I’ll use an eyebrow razor to shave my face. I’ll add a hydrating serum and shave downward so it doesn’t cut too close or the hairs too sharp. Afterward, my skin is incredibly soft, and even though I have more peach fuzz than most people, it doesn’t grow back darker, prickly, or with any adverse side effects. My sister was skeptical, but I convinced her to try it and now she’s just as obsessed as me. Another thing I like to do for my skin is sheet masks. I use different kinds, but in general, I look for hydration masks because I believe that hydrating your skin helps it heal faster. Lately, I’ve been using SKEDERM Snail Jelly Masks ($18.95 for 10 sheets) because they are affordable and are saturated with product. I hate a sheet mask that dries out too quickly. I am obsessed with exfoliating. Normally, I use gloves like the Salux cloth ($5.99), but this Sephora Collection Smooth Finisher Exfoliating Bath Mitt ($8) is the best thing I’ve ever tried. You’re supposed to soak in the bath for about 15 minutes to soften your skin, then just start scrubbing. You’ll see your skin rubbing off but it is one of the most satisfying things a person can experience. I’ve never been the person to moisturize my body everyday, but I try. 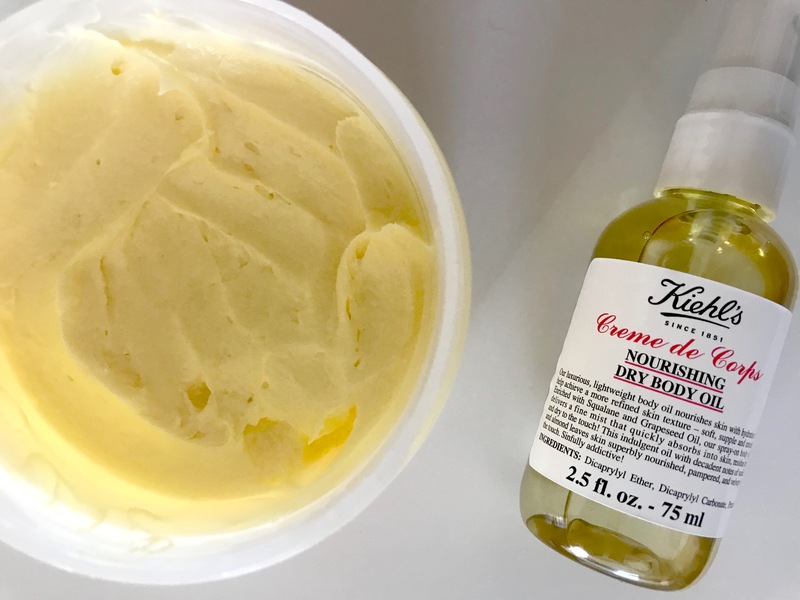 My favorite body moisturizer is the Kiehl’s Creme De Corps Soy Milk and Honey Body Butter ($49). It smells delicious and is a dream to rub on. Body oils feel super luxurious, so I also like to use the Kiehl’s Creme de Corps Nourishing Dry Body Oil ($34), too. Last year I finally started laser hair removal. My legs would burn and develop ingrowns and spots after I shaved, and it got to a point where I knew I needed to get rid of it completely. I went all in on a full-leg and bikini laser, and I’m so glad I did. Even after one session, I noticed an incredible difference, and after four, I hardly ever shave. My skin looks so much better because I no longer have stubble or the dark hair roots showing through my skin. One last thing that I consider part of my beauty routine is exercise. I do try to go for a quick run a couple times a week. It’s not only healthy mentally, but I like “sweating it out.” I like to think it’s cleaning out my pores and refreshing my body.